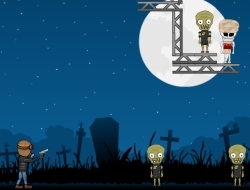 In this shooting game the zombie apocalypse is no longer a myth. You will have to try and kill as many of them as you can with a limited amount of bullets. If you manage to bring them all to silence, you will pass the level. Keep in mind that you can use the environment to your advantage, as you can bounce the bullet from the walls or you can start rolling heavy barrels with them, or even explode them to create lots of damage. There will be some zombies that if shot, they will explode as well, so you can try to hurt the others by shooting just that single one. Think before you shoot, so you can save all the ammo you can and receive a three star rank for the way you played that particular level. Use the mouse to aim and fire the gun. Bounzy 0.00 between 0 and 10 based on 0 votes.